Room with a lounge area, approximately 55m2, view on the park. In room : flat screen TV, minibar, bath and shower, phone, balcony. Room with a lounge area, approximately 55m2, view on the mountains. In room : flat screen TV, minibar, bath and shower, phone, balcony. 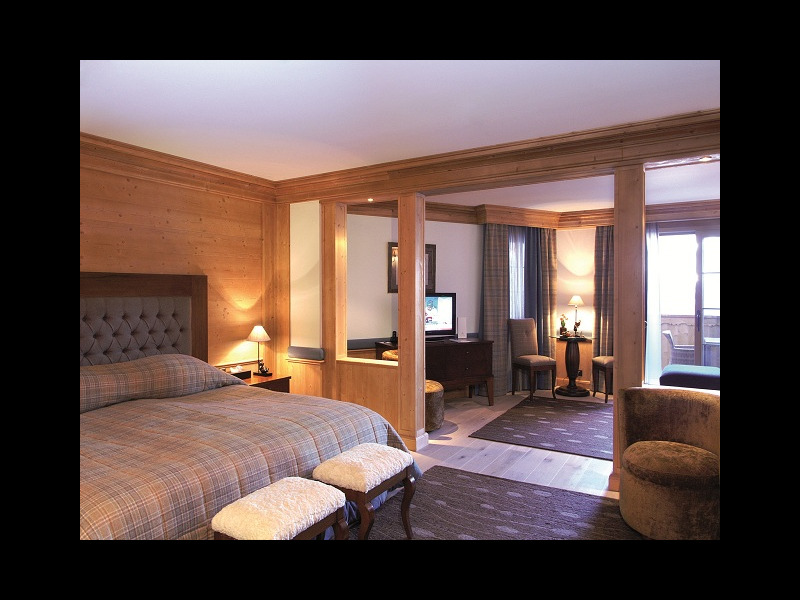 Located within walking distance of the heart of Villars-sur-Ollon in Switzerland, the Chalet RoyAlp offers a direct access to ski slopes in winter and to the golf club in summer. 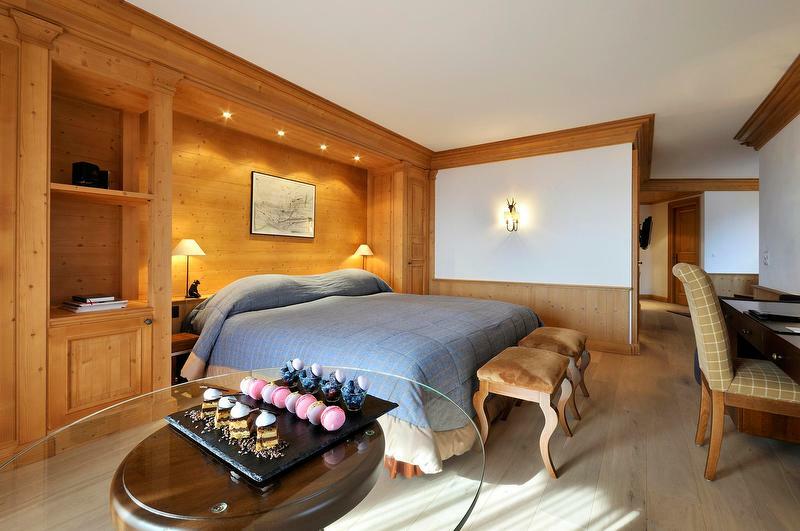 This architectural jewel combines the charm of a typical mountain chalet with the sophistication of a modern luxury hotel with a panoramic view of the Vaud Alps. The 63 rooms and suites associate comfort and design. Each room is entirely equipped with the latest technologies and a large bathroom to guarantee you a peaceful journey. Luxurious and spacious apartments from 80 to 260sqm offer you a direct access to the hotel services and have all the required equipment for your greatest comfort. 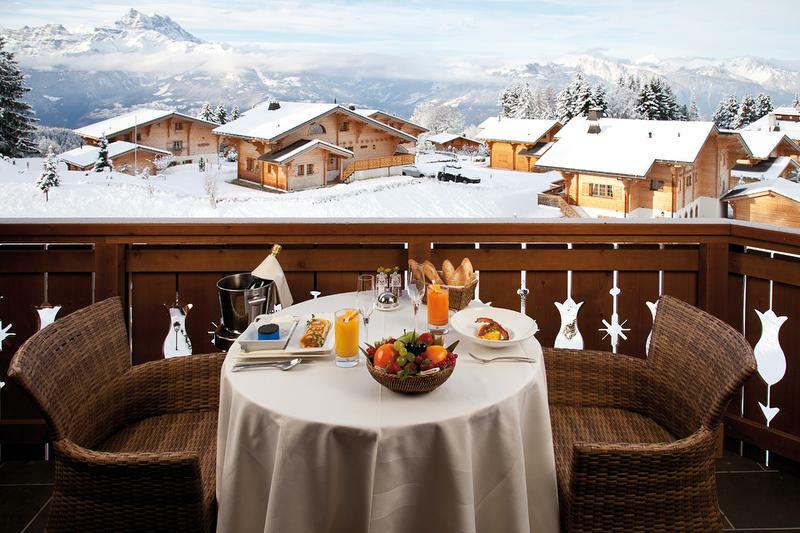 The Chalet RoyAlp team offers a large choice of food among the three restaurants of the hotel. Besides the fireside, enjoy traditional dishes with cheese in the Grizzly, a “carnotzet” with the appeal of an alpine chalet. Our Chef Alain Montigny, who earned the title of Meilleur Ouvrier de France in 2004, honours French gastronomy at our Le Jardin des Alpes restaurant by offering dishes made from farm-fresh foods. In a warm and elegant setting, enjoy a sophisticated menu featuring dishes that combine modernity and respect for the products and terroir. The « BeAR´s Bar » offers a light international cuisine anytime during the day in a cosy and musical atmosphere. Discover 1,200sqm of relaxation where all your senses will be fulfilled! Enjoy the indoor swimming pool, Jacuzzi, sauna, hammam, fitness center and multi-sensory showers, which make it an exceptional place. For an unforgettable experience, enjoy the Spa by RoyAlp with an array of beauty treatments (using Cellcosmet and Cellmen products) and massages. The six treatment rooms with their hushed atmosphere are managed by professionals proposing globally renowned brand-name treatments. A private spa, with individual facilities and a personalized service, completes the relaxation offer of the Spa by RoyAlp. Children less than 2 years old are not allowed in the Spa by RoyAlp.